Broke Neck Santa is the way Belfast residents affectionately refer to this fellow, a vintage Christmas light that has decorated the city's streets for nearly 40 years. Lots of towns have festive seasonal light displays that help to dispel some of the darkness that falls all too early in December in Maine. 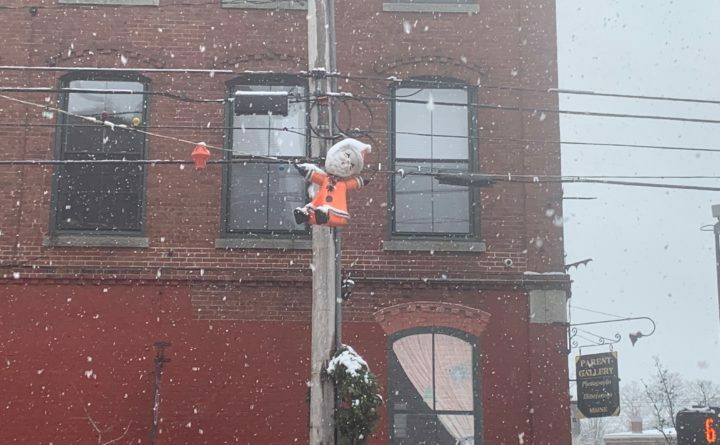 But only one Maine city’s municipal Christmas lights feature a vintage version of the jolly old elf with his head cocked at a deeply quizzical, not to say uncomfortable-looking, angle. That would be Belfast, and that’s Broke Neck Santa, as locals affectionately call him. The Christmas lights first came to Belfast in the 1980s, according to Belfast Fire Department Chief Jim Richards, who has held his position since 1974. Strings of twinkly red, orange and green lights are periodically interrupted by larger light ornaments, including snowmen, lanterns and three of the Santas. The lights were used when the city bought them, and from the beginning, they have been a conversation starter. “Everybody talks about them,” Richards said. 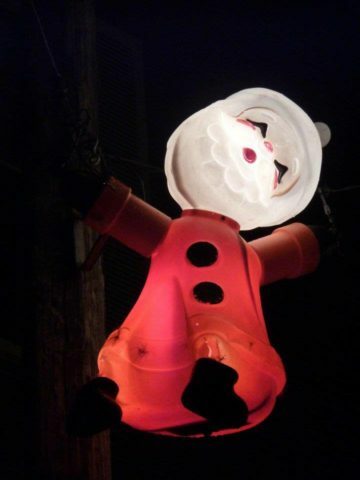 Another view of 'Broke Neck Santa,' an integral part of Belfast's holiday lights. Mostly, the conversations are positive ones, although the fire chief still feels a little stung by the time he was stopped by a local woman who complained about the Santas, which she thought looked disturbing. On the whole, though, Belfast residents appreciate their lights as an eclectic harbinger of the holidays. And maybe especially in a year that has been marked by strife around the city’s proposed land-based salmon farm and the recent discord between Belfast City Council and Mayor Samantha Paradis, Broke Neck Santa and the rest of the Christmas lights provide something just about everyone can enjoy. 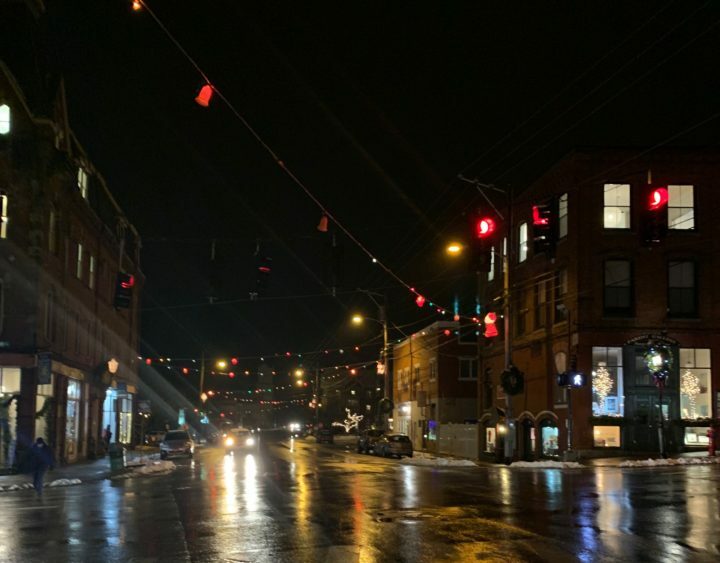 The lights are put up and taken down every year by Richards and the city’s volunteer firefighters who use ladder trucks and patience to get them into place. Years ago, the crew put the lights up all over downtown Belfast. Now they cover less terrain, but Richards, a spry man in his 80s, still takes an active part in putting them up around downtown, and makes sure they stay bright and lit throughout the holiday season. Festive, vintage Christmas lights have been a part of downtown Belfast during the holidays for nearly 40 years. Whatever the reason, Broke Neck Santa is popular in the midcoast city. He has his own Facebook page where fans share photos and even, sometimes, poetry they write. “Oh Broke Neck Santa, you hang at a slant, you’d like to look forward, but we know you can’t. Your odd point of view doesn’t seem to detract from your jolly old look, and that is a fact,” one fan wrote last year. For Mortier, the lights, and the Santas, are part of Belfast, but they are more than that, too. When she was a girl growing up in a small New Jersey community, her town had the exact same type of lights. “So later in my life, when I moved here, it was thrilling to me, the first Christmas, to have those Christmas lights on the street. It brought me back to my childhood. It was like a classic Christmas movie,” she said. The lights remind her of the past, in a heartwarming way, and keep her company when she is at work at night organizing New Year’s By The Bay, a tradition she helped start in 1997 and which remains popular today. “Broke Neck Santa and those Christmas lights are right outside my window, giving me a little Christmas spirit,” she said.